Perhaps it was the general market. Still, it was only a few weeks ago that Ford stock was labeled as a growth story per Mad Money’s Jim Cramer at Dearborn Truck Plant. Then came the 2011 North American International Auto Show (NAIAS) in Detroit which showed Ford with the largest display ever. It was no surprise that Detroit was getting mega media focus due to the 2011 Detroit Auto Show. Who knew that Jim Cramer of CNBC’s Mad Money program would even do his show as well from the Dearborn Truck Plant at the Ford Rouge Complex. Fact is, the market agrees that the fundamentals of Ford are strong. Furthermore, Ford Motor Company (NYSE:F) was slated by Jim Cramer to possibly double. It seems when compared to Toyota, though, Ford stock is under priced just in terms of positive press. Keep in mind that up to that time, only the rich could afford to buy a car. So, it seems that history may need to repeat itself, especially when the likes of Toyota keeps getting into recall troubles. That’s a story simply lacking in what it had always represented - quality manufacturing. How the trend has turned. 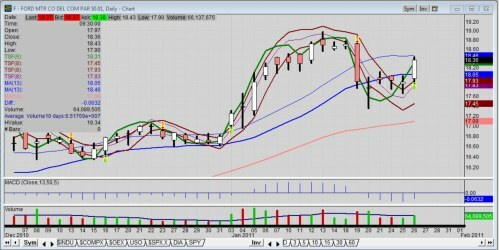 The daily chart shown above indicates a sell-off into the last day of option week trading. Although, the bottoming tails implied a potential for an up surge, today’s price action confirms that buyers are once again putting their money where their beliefs are - into Ford stock.